November FOG & Tuesday flight cancelled. Re-routed via Brussels the following day with an upgrade to Business Class – always a silver lining! Journey was great, champagne & a 5 course meal. Albert, the driver, was waiting for us in Father Konteh’s Toyota & we were whisked to the Lungi bungalow, perhaps 15 minutes from the airport. Early start, loaded and off to Makeni via Port Loko. Many police stops along the way, temperature taken, some hand washing & one passport check. 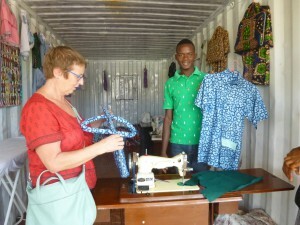 Mercy & Laurel standing outside the converted containers made into a sewing and catering business. First stop was St Joseph’s School for the deaf. What an inspirational venue, very happy children and a lovely atmosphere. We were there to collect our 6 boxes of mainly reading books which were shipped out in May, courtesy of St Anselm’s College, Birkenhead. Anne purchasing a bag for her ipad – couldn’t be persuaded to throw in the shirt to match! We then followed a different route, driving on dirt track roads through to Bo. We passed through many small communities, skirting along the Kangari Hills Forest Reserve. Beautiful scenery. We arrived at the Bo house late afternoon. There was time to walk around the school compound & look at the 24 Town Lots where we hope to expand and develop the OAKS school experience. The 24 Town Lots is mostly ‘bush’. 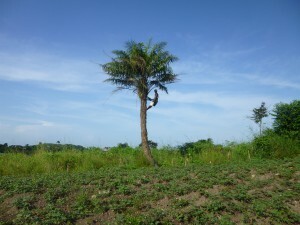 The chap tapping the tree for palm wine makes his living from selling the ‘grog’. He has 2 children at OAKS school. Today was mostly spent in the company of Joe Williams, the headmaster. 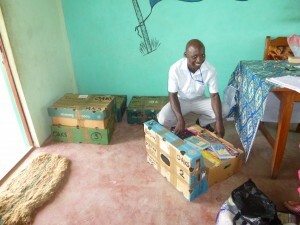 Joe excitedly opening the shipped ‘banana’ boxes of books. Joe opened the boxes we’d shipped, then we got down to business. We looked at school improvements, discussed progress plus all the up & coming challenges. The whole school was in the process of exams, everyone working in silence. That day’s paper was Agriculture, printed & delivering an element of multiple choice with essay writing, a well constructed and challenging test of ability. Al fresco exams for Junior Secondary. Mr Jarrett, the bursar, gave me all the receipt books & ledgers so I could get to grips with the Audit. This was going to be a great way to spend our first weekend! A National Population Census is being held 4th December and many teachers will be needed to administer the process. Just in case this requires schools to close early for Christmas, or to struggle along without key staff, there is a mad panic to quickly sort internal exams, class promotions, report cards and to organise the new intake for Class 1 & Junior Secondary School 1. The post Ebola ‘catch up’ measures have declared January 2016 to be yet another new school year of only two term duration, so there’s internal pupil promotions to consider & a new JSS1 to screen. 7th November, Sierra Leone is declared Ebola Free. Honda bikes peeping their horns, hands waving, people shouting. A long 18 months of Ebola, now gone. Such celebration, people marching, bikes riding in procession, no doubt later to be accompanied by parties, plenty of palm wine & dancing. 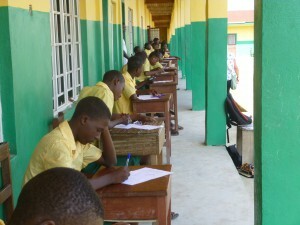 Exams took place in school for Junior Secondary, even on this auspicious occasion. Today was maths, quite a challenging & wide ranging – decimal, ratio, fractions, Pythagoras, geometry, problems, bases, long multiplication etc. Pupils were working without calculators, high class maths skills were on display. 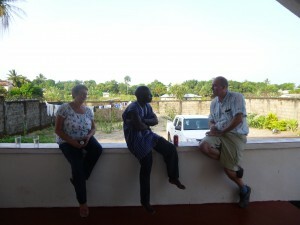 Visitors to the house today were Sam the mines inspector plus later Lawrence & Mustapha, the builders. Sam had lots of helpful advice about applying for Government Assistance with the Education Department. The format for our staff training day, Friday, is starting to take shape, we need to view this as ‘new beginnings’. Ebola is over, school is now re-established into ‘normal’ routine, it’s time to check the foundations of ‘Teaching & Learning’ & to move forward. What are our qualities? What skills do we need to develop? What sort of training is required? Sitting on the balcony cross-checking receipt books with ledger. We waded our way through school fee receipts, bank deposits and purchase invoices. All checked & cross checked. Bank statements, wages, NRA & NASSIT. No doubt Nick will require a whole series of photocopying for the Charity Audit – we’ll wait until he specifies. Delivered some of the materials sent to OAKS from friends in England. Mike Baio was very excited by several pairs of boxing gloves & sparing pads from Clare Mount School, plus some PE shorts & football socks. 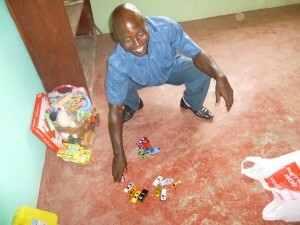 Lots of cuddly toys & small toy cars for class 1, 2 & 3. Some box games too for the toy cupboards. We also had pencils, crayons, rubbers, pencil sharpeners, small white boards & dry wipe pens from Wendy Hilton’s school Castlehill, Wigan. Fascinating to observe the spread and anomalies of results. It will be easy for the teachers to digest & discuss how it shows progress & highlights problem areas. We arranged to meet Mr Souri from The Tony Blair Academy. He’s kindly offered to come & collect us. We need to start understanding the time tabling commitment, staffing implications and building requirement to slowly move into the Senior Secondary sector. Oh dear, no Mr Souri, called away to an emergency meeting in Freetown. Away from the exams, reading columns of figures & discussing our findings. Instead, we spent a considerable time in the temporary library, the classroom for JSS3, the current library is still laid out as a ‘sick room’ for Ebola Regulations. We were gathering subject exam data ready to be displayed via ‘tally’ graphs, ready for training on Friday. Mr Jarrett the bursar kindly took us in his car to the Tony Blair School. We were shown around by Class 1 teacher Victor. 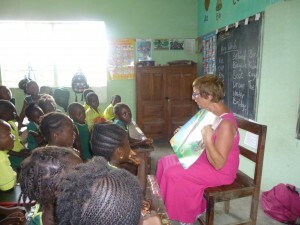 Firstly we were introduced to his class – there must have been in the region of 75 pupils sitting 3 to a desk. 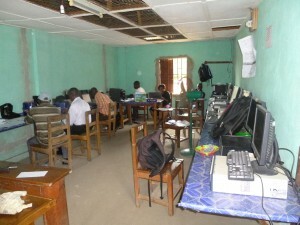 A dark & cramped environment, but they all seemed happy & keen to learn. There then followed a conducted tour of the new & ongoing building of Senior Secondary provision. The school caters for pupils from Nursery right through to 6th Form. 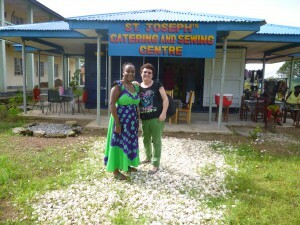 It provides extra facilities such as the making of uniforms & the provision of lunchtime food. It probably educates anything up to 1,000 pupils. However, it is ‘Private’ and must make an overall profit for the owners, therefore it charges very high fees and has large class sizes in Primary. Computer suite. Always problems, some terminals off line & printer playing up. Technician on his way! The Tony Blair School has a very small science lab, nothing like the basic requirement that would be expected in an English school, there’s a general paucity of equipment. There is also a very basic computer suite, but at least they have some facility. However, Sierra Leone in general is sadly lacking in the provision of Information Technology, the electricity supply is poor & unreliable and access to the internet is not easy & rather expensive. We need to solve the problem of providing power before we can consider computers for pupils at OAKS, however, it is on our agenda. Anne & I persuaded Rey Jarrett to take us into Bo on our return journey to look at dress material. He was most patient whilst we scrutinised the bolts of cloth. Anne purchased some blue material & I chose an orange & red pattern, plus an orange & brown squiggle. We now need to visit the tailor!! Our trip into Bo culminated with a visit to the air-conditioned super market. 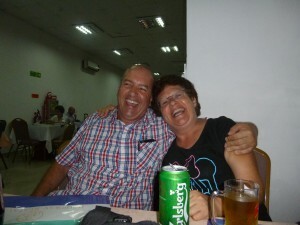 We were very restrained, only buying some new drinks glasses for the kitchen, ready for the arrival of Nick & Margaret. Look at the posters, choose your design, discuss modifications, quick measure & it’ll be ready in a few days. All done on a Singer treadle sewing machine. Angela & Ema, from our bungalow compound, later accompanied us to the tailor with strict instructions on the amount we should offer to pay for workmanship. They were not impressed when we agreed to slightly more. Each garment was just a few pounds for what we considered to be rather a lot of work. We planned in detail our training session. The small white boards were a great help. The main questions & statements were penned, this would save ‘bobbing up & down’ time, not having to write everything on the blackboard in the classroom. Nick & Margaret’s flight was delayed in Paris, a technical hitch. They were 3 or more hours late in landing, no ferry available to Freetown. 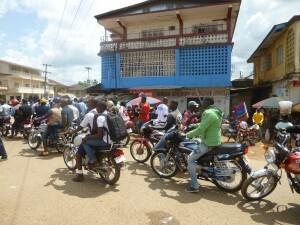 Albert drove them through Port Loko – think they arrived at St Edwards in Freetown at about 2am!! The travel fairies have not been on our side this visit. PART TWO – Joined by Nick & Maggie. 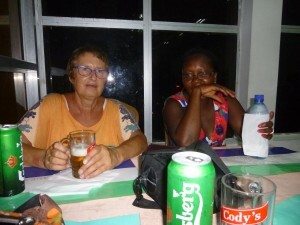 Nic & Margaret decided to shop for our Sunday party whilst in Freetown as most of the Government offices were closed. Father Peter had also offered to introduce them to the Catholic Church’s Education Advisor later that day; he would be able to advise who to see & also to assist in making various appointments, a very good idea. Meanwhile at school our training day in Bo, we divided the staff into 3 groups and gave them topics to brainstorm & to report back to the group using the white boards to record their thoughts. Lucy, Eric & Patrick. What is good training? What training do you require in the future? Princess, Mike & Chris. Great discussions – what makes a good teacher? There were wide ranging questions on qualities, strategies and requirements to move forwards. All embraced and enjoyed the challenge. Some good ideas for my next visit to provide ‘one to one’ opportunities and to look at reading strategies. The exam analysis gave rise to other ways of thinking and assessing. Initially the concept of an exam being too easy or too hard as reflected by the spread of results was a difficult idea to grasp. This was a challenging session. Discovering during this topic that their exposure to the concept of ‘exam moderation’ was zero it has opened up a whole new area of thinking & planning, new skills to be developed. It will be very interesting to see how this experience colours their examination planning for next term. Some thoughtful & structured training is required. Joe, the Head teacher, found these new ideas stimulating. He’ll study future tests & results with greater focus, interest and with a critical eye. We expected Nick & Maggie to arrive any time after 2pm. They finally put in an appearance just after 4pm. There was great excitement. The compound erupted into shrieks of delight; not far off 2 years since their last visit of February 2014. Anne, Joe & Nick siitting on the balcony . Albert, the driver was keen for a nice cold beer, at the end of a long journey. He then had to wait for Father Peter’s arrival. Joe our head teacher called in to greet Nick & Maggie & decided to stay and await ‘the priests’, the 3 Fathers. We had a mini party, soft drinks, beer & brandy. Lots of discussion & advice as regards applying for Government Assistance. It would seem this idea must go on the back burner for a while. Lots of pit falls and an Administration which is a bit of a minefield. We all learnt rather a lot. It reinforced the notion that we definitely require the help of either DFID or the Foreign Office or both. 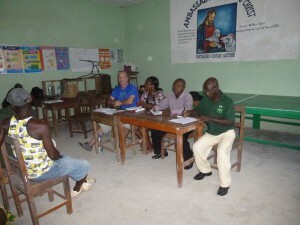 Father Peter Konteh in pink shirt, 3 Catholic priests popped in to offer some advice. Maggie had bought fish & chicken in Freetown ready for Sunday’s party. The girls were despatched to buy ice. The following day a cool box was purchased. It’s hard to keep anything cold & preserved, storing food is difficult in such a hot climate with limited facilities and unreliable electricity supplies. Later we settled to our pasta & mince, more of an English evening meal. Lots of chat to catch up on & an agenda to plan. 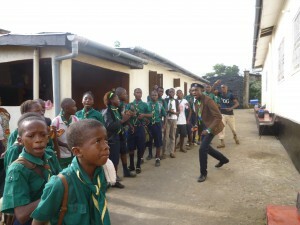 Freetown to see Education; Enrolment & Staffing for January 2016; School meetings – Parents, Governors & Staff; Research into local wage structures; Government Agencies in Bo – NRA, NASSIT & Education; Marie Stopes; School maintenance; Scouts; Future Development of 24 Town Lots & Some fun with staff & pupils – phew, will we be able to cram it all in? 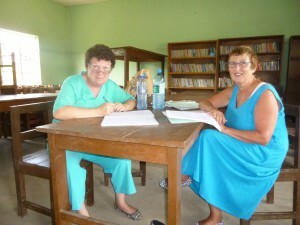 Anne & Margaret off to town to visit the market whilst Nick & I attended the interviews for the Class 1 intake to start school in January 2016. 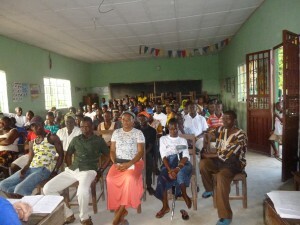 The school hall was the venue for enrolment. 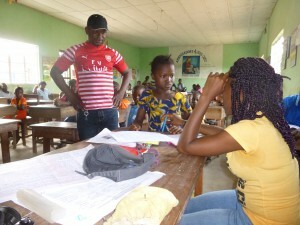 One by one in order of application received, each child had a brief chat with Isata & Max, the Class 1 tutors. Isata quietly interviewing, checking details, age and ability. Amazingly most of the children could recite the alphabet, a sign of how important the acquisition of English is becoming. 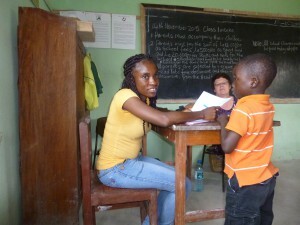 Only one child couldn’t speak any English, not sure whether his first language was Mende or Krio. There was also one boy who couldn’t speak at all, I think he was totally paralysed with fear of ‘the white people’. Max took him outside & he was apparently fine! Nick & I later took a stroll up to the 24 Town Lots (A Town Lot is 70’ x 80’). 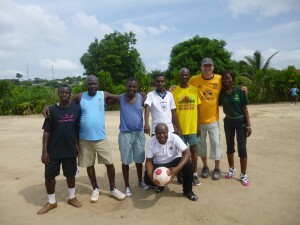 The bottom corner is cleared and used by the local youth as a football pitch, however, the rest is very overgrown. Nick is hoping the Community will clear or brush the whole area this spring and burn the debris before our visit in May. It’s almost impossible to survey in its present state but by May perhaps we can achieve an overview & decide how the land could be developed to extend & expand the OAKS experience. The school parents are keen to use this land for Sports Day in February 2017 – a very large area will be required, as they want a full size running track. Anne had a great time visiting Bo’s market & then learning how to cook and prepare food in an ‘outside kitchen’ on an open fire, with Maggie & the girls. Anne, Martha, Maggie, Nick & Joe. 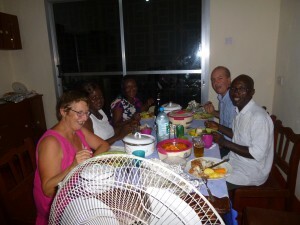 Saturday evening the Headmaster Joe & wife Martha joined us for an evening meal – really scrummy freshly caught fish, a great treat. We learnt that Martha was in Bo when OAKS first started, although Joe was working away from home & out of the country at the time. Quite fascinating for both Nick & Margaret to hear all the various details and people Martha recalled from the early days – 2006/2007 onwards. An ‘all our yesterdays’ moment, with lots of chuckling and hilarity recalling the crazy scenes when first opening up the area, bridging the swamp between Lewabu & Mendewa, plus the many characters from the past who both helped & hindered progress! Party day. Church was early so everyone had time to prepare food and to set the scene with tables & chairs. We were desperately hoping it wouldn’t rain and it didn’t! The disco arrived, set up & was outrageously noisy – is this a sign of age!? The staff really enjoyed themselves as did the Education Inspector, Chairman of the School Management Committee, Chairman of the Parent’s Committee, the Local Chiefs, Building contractors and Community friends. 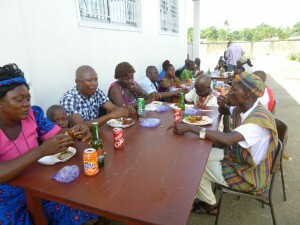 Lots of good food, palm wine & dancing, a good time had by all. Great to entertain Mr Badera & wife from a local Mission School, he’s really helped us set up Junior Secondary and has become a very good friend to our Head teacher, Joe. We had a late arrival, teacher Francis, he’d been on a course & no-one told him the start time of the party, he’d assumed it would be early evening!! However, he managed plenty to eat & drink and was more than happy. Maggie enjoying party, dancing bottom right. A slow start at school, many of the teachers thought marking exam papers was preferable to teaching. However, we soon got things underway. This was my first chance of lesson observation, I was keen to get cracking! Anne wanted the freedom to just wander in & out of classrooms to get a flavour of activity. Nick began the analysis of the daily staff register and had his first meeting with the bursar to discuss finance. Around 10.30 Mr Jarrett drove Anne & Nick to three different schools, New Harvest, Aladura & Tony Blair, for research into salaries and the new minimum wage. Maggie then joined them for appointments at NASSIT (National Insurance) & NRA (Inland Revenue). Both these meetings were very convivial & constructive. 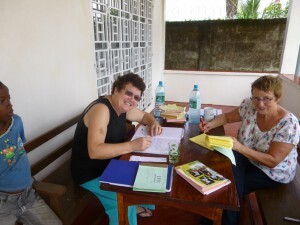 More letter writing & photocopying for a letter to go to the Freetown Tax Office that evening. Back home late afternoon Ema brought our clothes from the tailor, Anne & I were very excited, something new to be worn at the Spring Ball. Anne posing with Fatmata. Wearing an African outfit, but not the one for OAKS Spring Ball – that’s under wraps! Maggie and Angela set off very early to Freetown, her mission was a meeting at the Education Department regarding our application for the registration of Junior Secondary School. If we cannot gain a registration in our own name, we will have to pay for the BECE to be taken by Year 9 (JSS 3) under another school’s name & they will receive the credit for any results & not OAKS. We have been trying to obtain this document since March 2013!! Nick began an in depth look at school maintenance before returning to the study of each class register discussing information, layout and analysis with each individual form tutor. There were further discussions with Mr Jarrett, checking documents & talking about priorities for floor repairs. Late afternoon, 4pm, we attended an SMC – School Management Committee meeting. 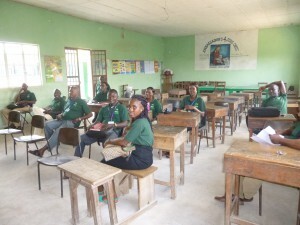 This usually comprises SMC Chairman, Local Chief, Chair of Parent’s Committee, Head Teacher, Bursar, Education School Inspector, Female Representative – a local nurse, Lovetta & a representative of local youth which is our classroom assistant Max. 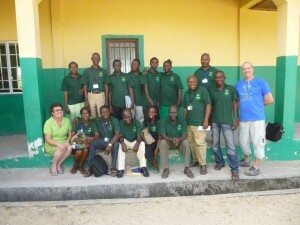 Nick presented the SMC, apart from the new School Inspector (an unexpected addition), with OAKS polo shirts. Mr Gorgra will get his on Parent’s Evening. It was a very lively meeting. We apparently need to appoint an independent youth member to the committee, not someone who is attached to the school. We think we’ll invite the young scout leader who spends quite a lot of his time drilling and teaching OAKS scouts after school in his own time. The Chairman & the School Inspector insist there is nothing to fear from becoming Government Assisted and they would welcome an application – we feel we need some concrete advice about the ‘fors & againsts’ from the British High Commissioner & DFID, plus someone to steer the application through, guaranteeing an understanding which contains all our safeguards. 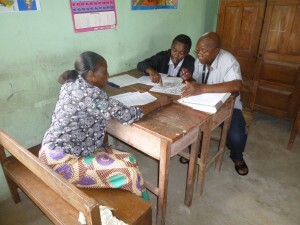 Maggie returned very late, exhausted, but she’d managed to see the Director for Education at the Freetown Education Department and was ready to forge forward with registration documentation via Bo’s Deputy Director the following day. 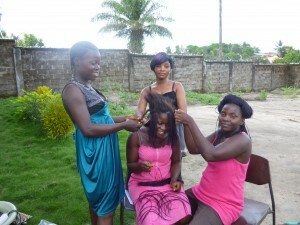 Angela having her hair done, Ema sitting on right. All love having their hair done. Colourful hair extensions are all the rage! 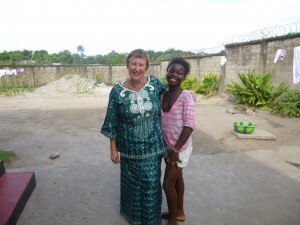 Angela had had a great day, she’d never been to Freetown before, she was so excited. She spent some of her savings on hair products for the Christmas market, items unavailable in Bo. 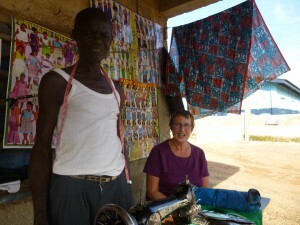 Max, Angela & Ema have built a small structure opposite the compound on Maggie’s land where they want to open a shop. They’ll sell food and offer specialist hairdressing products & styling, they’ve lots of ideas and are very keen to go into ‘business’. The evening wasn’t over until all the school documents were photo copied with a cover letter ready for the scheduled meeting with Mr Swaray, Deputy Director of Education Bo, the following morning. Nick also spent some time formulating his research on staff salaries ready for a new wage structure & his scheduled meeting with staff tomorrow afternoon. Nick continued to visit other local schools, Zenith & Arawallie. He & Maggie met up to see the Deputy Director of Education, Mr Swaray, who tried to be encouraging, urging them not to give up, OAKS JSS would be registered, he would redouble his efforts. OAKS is one of the top schools in the whole of the Southern Region and he is very keen that we are not discouraged and he wishes us to develop further. Marie Stopes was visited in Bo Town to renew our acquaintance post Ebola and to encourage links with the school & parents. We feel we have a duty to our local community to facilitate Family Planning as well as to care for our pupils, we must keep our girls in education. Nick rushed back to school for a meeting with Basharu Kamara ‘Bash’, the solar power engineer, to discover the energy capacity required at OAKS. Bash imports solar products from Germany and electrical items from The Emirates, not trusting the quality or availability in Sierra Leone. Staff gathered in School Hall. Staff picture in their new OAKS polo shirts, with Nic & Laurel. 2pm saw a meeting with the staff in the school hall to discuss the hot topic of wages. The mammoth effort of visiting Government & Private schools throughout the area gave Nick up to date data on which to base the wage rise for December. A fraught balancing act because those at the bottom required a significant rise to satisfy the minimum wage whilst differentials needed to be maintained. The only person not to receive an increase was our bursar as it was discovered he earns significantly more than others in the private sector. We appointed Francis Rogers to lead Junior Secondary School in January and Eric Kobba to join the team as a form tutor, along with Patrick Goba. It’s important these pupils have the support of staff who know them and OAKS well. Our new staff appointed to start in January especially for JSS, will begin as joint tutors for Class 4, whilst they get to know our system. No sooner had this meeting taken place, it was almost time for Parent’s Evening. Such hectic busy days, so much to accomplish before we head off home. Addressing the meeting from left, Nick, Margaret, Moses (Chairman), Joe (School Head). Parents Evening was to tackle yet another hurdle, School Fees. At present parents pay Le 12,000/term plus Sports Fund Le 5,000, a total of Le 17,000 & our aim was to raise it to Le 25,000/term as from Easter, this equates to just over £3/term. The maintenance of the building keeps increasing, we’ve had to purchase and repair more furniture but our biggest outlay has been on floor repairs. The school fund should be able to meet repair bills and not have to put a further strain on the charity which has to find a substantial amount extra to meet the salaries of two more staff from January and an ever increasing wage bill. We will intigate a further wage rise in September. The school hall had about 20 parents when the meeting started at 4.30 but it was standing room only when it finished at about 6.30. Hall full, some parents sitting outside. There was much appreciation for all the repairs carried out during the Ebola crisis and the monies sent recently for new furniture, toilet repairs and upgrades. A genuine welcome for the commitment to renew & repair more floors and the corridor. Also, the school would be re-painted again by parents during the Easter recess, with OAKS paying for the paint. Although there was much discussion the new School Fee was agreed, they value their school & its undoubted achievements. One parent mentioned she had taken her son from OAKS to her nearby Government School, expecting it to make her life a little easier. However, once she realised he knew more than his class & also more than the one above she very quickly returned him to OAKS, there was absolutely no comparison & she thanked us all most profusely – her son wouldn’t be going anywhere else! The very long day was still not done. Time to do the tally graphs for the latest exam results specifically for JSS 2. Big decisions to be made, who to promote after Christmas to JSS 3, these pupils will be taking our very first BECE National Exam in June. 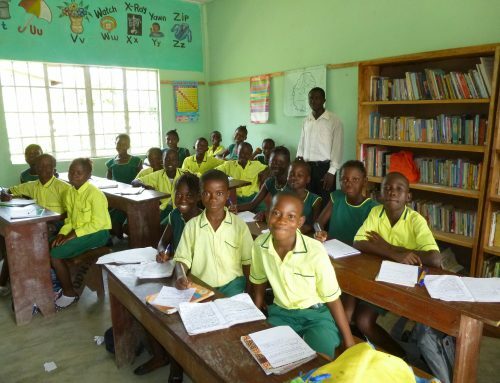 They have to have a good score in the core subjects of Maths, English, Science and Social Studies & then pupils can choose a further 4 topics that they’re good at from the other subjects offered, Business Studies, Home Economics, Agriculture, Mende, Religious & Moral Education, Creative Practical Arts and Physical Health Education. Mr Jarrett’s Office will become the Option Classroom for JSS3 & when they’re not being taught they’ll be able to study quietly under supervision in the Library. Mr Jarrett will share Joe’s office. We produced an option sheet for each member of JSS2 to do a quick choice so that it would give Joe a rough idea of the spread of demand so he could start thinking about a time table and also decide which subject strengths he requires from his two new staff. Joe and his interview panel need to appoint 2 new staff for JSS3, science & English and a replacement for Bassie, another English teacher. Maggie & Nick renewed an acquaintance with a local business man Atalah & his son who runs the Zenith School & a road haulage repair shop. They had long discussions about solar and how it’s becoming a new government target for refurbishing their main buildings, this would certainly improve life in Sierra Leone as it is rolled out through communities. The unreliability of power is really holding back progress. Maggie then met up with Mr Kanneh whom she’s known for years. He now has a side-line business with cars and he works as a driver. They visited his wife’s clinic, which was fascinating and this has given Maggie renewed vigour to achieve another of her dreams – A Clinic at OAKS School. Class 1 being read a ‘Big Book’ story. I’m hoping Mr Kanneh can now be relied upon to meet us at the airport, he tells me we can drive via Port Loko straight to Bo. This would be great, I’d save a day by not having to stay overnight by the airport, I’ll try this in February. Oooh that’ll be good. Nick & Maggie also met up with the builders to review the dilapidations at Maggie’s parent’s house, it desperately requires a new roof before the next rainy season. 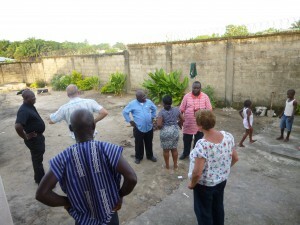 They then strolled across the highway to view Lawrence & Mustapha’s new work shop premises for their building business. Class 6 being taught a ‘problem solving’ game. 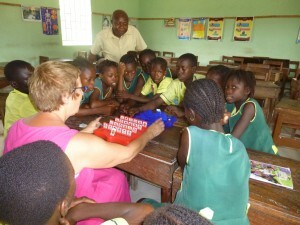 At school Anne played educational board games with the Upper Junior classes whist I completed lesson observations. I also made a start on checking classroom cupboards and stock books. During the afternoon, I joined in singing and reading with the Infants, a nice bit of fun! Our last day was a sports day. The whole school took part. Relay races, team games and finally Staff v JSS in a football match. Nick had a great time, ‘in goal’ as well as a mid-fielder. Think he pulled more than one muscle!! Pupils won 2-1, they were very excited. 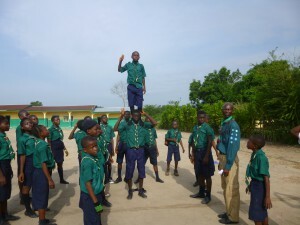 The scouts were all in uniform and put on a display of marching, singing and acrobatics for us. They’re off to their first camp tomorrow – sponsored by UK Scouts, Birkenhead 5th. Scouts demonstrating their skills and drills. Back home, the grand tidy up & packing. So easy, virtually nothing to take home, just pack cases for the store room and check what needs to be brought out next time. The children in the compound wrote lots of letters – Fifi who is 6 decided to become a pen pal to two girls, Ruby-Blue from Chester & Charlie in Neston. She’s greatly looking forward to her replies. Lots of singing greeted us in the distance, gradually getting louder – all the scouts arrived with their kit to say farewell, walking to their camp venue probably 4 miles away. All smiling and looking forward to an adventure. So heart-warming, it made us all smile. Scouts on their way to camp. Singing & parading around our compound. Father Konteh’s driver, Albert arrived around 10am, we loaded up & headed off around 11am. We drove straight to Lungi. We met Father Konteh for an hour & then we were dropped at the airport. A nice drink in the departure lounge, pleased the marathon was coming to an end. Anne & I were so disappointed, we had to turn right on our Air France plane, back to Economy! Anne & Maggie enjoying a well earned drink before overnight flight. Nick & Laurel thrilled with progress. Another hectic trip virtually done & dusted. Great that the kids get their Christmas Party next month. 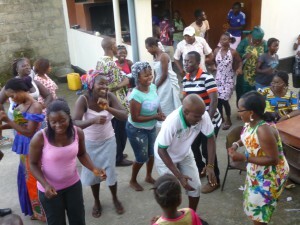 Really fantastic Sierra Leone is now Ebola free. Fingers crossed we do well in NPSE – results due before the end of the year. 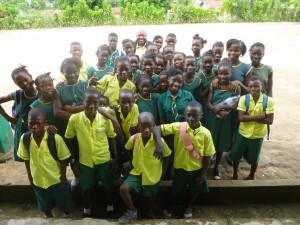 Members of Class 6. Some of them thought the NPSE in September was sweet! Another marathon ticked off, what a lot we’ve collectively achieved. Home in time for lunch Sunday 22nd November.